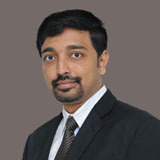 Dr. Shyam Shankar obtained his MBBS from Al-ameen Medical College, Bijapur, India 2004. He later obtained MD (Radiodiagnosis) from Jawahar Lal Nehru Medical College, Belgaum, India 2009 and was awarded Gold Medal from KLE University. Dr. Shyam’s work experience includes Assistant Professor in Christian Medical College, Vellore from 2009 -2011, Teaching faculty for undergraduate and post-graduate students. Has 7 publications in international and E-journals. Later worked as Consultant Radiologist in Columbia Asia Group of Hospitals, Bangalore, India 2011-2016, Teaching faculty for DNB post-graduate students and an active participant in inter-departmental meets. Special interest in USG, Color Doppler of Transplant, Neuro and Abdominal radiology. Dr. Shyam can speak fluent English, Hindi, Kannada, Telugu and Tamil.